With all the Bras with Flair on the Square bra-decorating parties I’ve been going to, I’ve been keeping my eye on my favorite lingerie store (La Silhouette in Madeira) for sales/new arrivals so I can go and stock back up! I signed up to “like” their Facebook page so I get the heads up on that info. A few days ago, they posted photos of some unlikely new arrivals. Not the bras I was expecting… they posted about new belts, bags and necklaces they just got in. They were like none other I’d ever seen before! There was one common theme for all these accessories: Scarves. I talked to the shop owner, Britt. 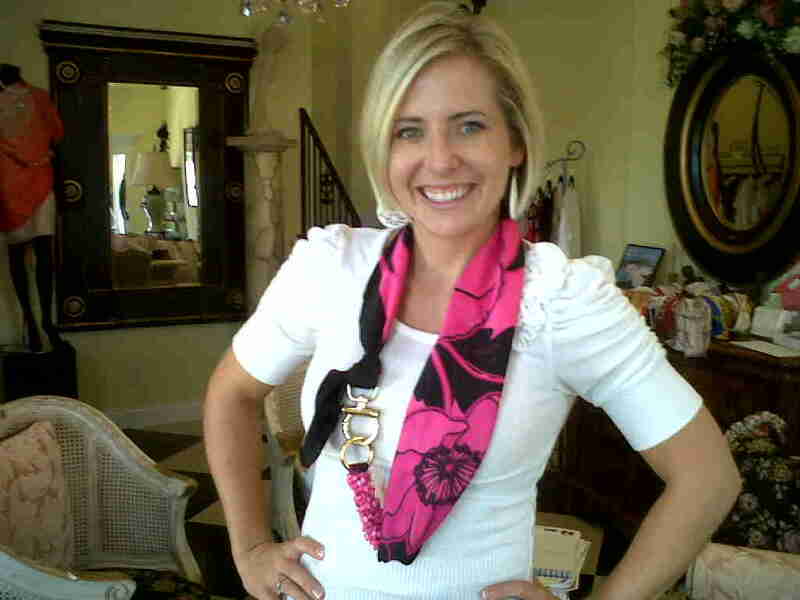 She and her husband found these Stefano Handmade Silk accessories when on a trip in Positano Italy. The belts are $65, the handbags are $95, and necklaces are $50. They come in all different colors and patterns. One side of the buckle on the belt is matching coral and the other side is knotted so you can adjust it to be exactly the size you need it to be. They’re really beautiful items. Thought you’d enjoy having a look-see. So, I did a little video to show you all the different ways to wear them! Enjoy!